Opinion (Karlheinz Ruckriegel, happiness researcher at the Georg-Simon-Ohm Hochschule, University of Applied Arts in Nuremberg): “There, where people go through the daily struggle to survive, they are unlikely to be fully satisfied with their lives. They have a direct relationship between income and satisfaction. They say that happiness is not money, but in its quantity. “However, starting from the GDP per capita of 10 thousand dollars a year, this dependence weakens and after 20,000 is lost completely. Previously, workers simply worked hard from start to finish, got paid and did not require anything else. “Today, what is important is self-realization, to be engaged in interesting matters. In work, people seek success, friendship, recognition, projects with future and opportunities to reveal their talents. In general, gross domestic product is not an indicator of public satisfaction. “The greater the social inequality, the less happy its citizens are. This is particularly evident when already at birth, people have unequal chances, and throughout their lifetime, they cannot change this situation. This affects both objective indicators, such as life expectancy and health. “The level of well-being is effected by social contacts, active participation in public life, work that brings satisfaction, benevolence, health and inner freedom. My Comment: Our egoism is growing and requiring greater qualitative fulfillment. So today more than ever, people are very seriously studying the sources of happiness. It is said that Abraham begot Isaac, and Isaac begot Jacob. In our world, a son continues the business of his father and therefore he is considered higher than his father. In contrast, in the spiritual world, the preceding one is higher. The son is a result of actions of his father, but in a worse state, in a more coarse desire. Thus, Isaac is a lower state than Abraham, and Jacob is lower than Isaac. On the other hand, the deeper and stronger desire, the more opportunities it has to be corrected in similarity to the Creator. Therefore, from the point of view of the generations’ development, every new generation is worse than the previous one. However, from the standpoint of using the level of desire, every following generation rises higher, i.e., it attains greater Light. Therefore, something that was impossible to do for Abraham, due to his small depth of desire, is manifested in Isaac, in his left, egoistic line. This work does not belong to Abraham. He only has to “tie,” to limit his awakening egoistic desire. Whereas, Jacob connects with both forces and begins to realize himself. As a result, a soul begins its development and it consists of two properties. People who are passionate about spiritual ascent and believe think that we live only for this, come together and assume the obligations of mutual guarantee: supporting one another and are in communication with each other. They are incorporated in one another, work together, spur one another to appreciate the greatness of the goal, and try to connect in love and bestowal in resembling the Creator. By working on the greatness of the goal, they feel their lowly nature and, at the same time, this doesn’t detract from it, but rather, they make an effort to annul themselves without suppressing their ego but by restricting their use of it. Very fine work is required here: not to despise one’s lowly nature, not to kill it, because it is necessary as resistance to the upper nature, since the intensity of the soul is built in the gap, in the tension, in the delta, between them. The spiritual world isn’t absolute in that respect. It is absolute in another respect: Everything that was created has its own meaning and a right to exist. Even things that seem most harmful to us cannot be destroyed in any way. A great problem is created as a result: How do you work with that? On the one hand, you are ready to destroy some negative attribute so that it will not be part of this world, and on the other hand, you cannot do that since it has a right to exist. It says in the Torah: “If someone intends to kill you, you should kill him first,” but this expression doesn’t refer to physical destruction but rather to “killing him inside you,” so that this attribute will not speak in you. It has to exist but in a dead form. To die in our world means to disappear. But in the spiritual world it doesn’t mean to disappear but to be dead forever. The Torah instructs us that we should only annul the egoistic attributes so that they will be inactive. This thin line dictates our whole philosophy of life. It is the difference between the wisdom of Kabbalah and all the other wisdoms. Therefore, in many cases a Kabbalist’s behavior seems strange. I remember how I couldn’t agree with my teacher: “How can it be that I will suppress this attribute now!” And he would answer: “You mustn’t! Leave it until it withers and dies.” But this dead attribute must exist. Question: What do we mean when we say that we must hate our ego? Answer: To hate means to stop using the ego completely! You cannot destroy an egoistic attribute. It appears in you and you have to decide whether you use it or not. If you don’t use it, it means that you kill it. You cannot do anything more than that. Then this attribute can reappear in you at the most unexpected moment. Question: What is this system called Israel, by means of which it is possible to solve all of our problems if we learn to work with it correctly? Answer: In all of creation one unique force of bestowal and love is at work, besides which there is nothing. It is called the upper force, the Creator, because it created all of reality. And likewise, this force is called Creator (Boreh) from the words, “come and see” (Bo ve Reh), because we need to discover it. The goal of creation is to discover the Creator, as it is written: “For they shall all know Me, from the least of them unto the greatest of them” (Jeremiah 31:33). So that we can attain the goal as rapidly as possible, the upper force acts and influences us all the time and calls to us to discover Him. Approaching spirituality means to resemble the Creator. The Creator is good, and you need to become good too. “Just like He is merciful and kind, so should you be merciful and kind” (Talmud Yerushalmi Peah 3:1). It follows that we must keep improving ourselves, not do to another what is hateful to us, and love the other like yourself, as it is written, “Thou shalt love thy neighbor as thyself” (Leviticus 19:18). And this is possible if we become like the higher force, the Upper Light. The Creator created the evil inclination by which we are separated from each other and do not want the spiritual world, development, or advancement. But if we reach the awareness that this desire is bad, then we can correct ourselves with the help of the Torah, meaning with the help of the Light that Reforms. The Torah is the remedy for our evil inclination, for the ego. The Light can heal us and transform the ego into its opposite: a desire for bestowal and love. The power of bestowal is called the Creator, the good and benevolent, the Light. This Light influences us and when it illuminates more strongly, then we feel bad, since we feel the evil instead of the good because we have not adjusted to it. The more strongly the Light approaches us, the more evil we feel ourselves to be. All of the bad feelings also come from the Light, from the Creator, about which it is written: “I will place over you a king like Haman who will return you to the good against your will” (Sanhedrin 97b). By fleeing from evil, we approach the Light a bit. But this way is called the way of suffering, “in its time.” But we can begin to correct ourselves by our own initiative and create the good force, that is, build a group. A group is a collection of people who nullify their egos and begin to make themselves like the force of bestowal. To the degree that we bring ourselves in accord with the Creator, we approach Him willingly. In such a way we advance, don’t remain His opposite, and don’t flee from the blows. Rather, we are attracted towards Him by our own efforts. We don’t wait to be pushed from behind by suffering that obliges us to run; rather, we hasten towards the Creator by ourselves, and we want Him. This is a positive movement. Question: What does it mean to advance and move towards the Creator? Answer: In nature there exists a simple law of adaptation by which objects approach each other according to the degree of their equivalence of form, equivalence of their characteristics. So if we develop the power of bestowal within us, we approach Him. And through getting nearer to Him, we come under His good influence and feel our development as good. Question: How can a group of people create this power? Answer: This power is discovered through the connection between us. This is a unique group comprised of ten people who give up their egos to attain a place of common connection. They leave their egos behind and want to unite in a new place. This is called becoming “like one person with one heart.” The common place in which they are all connected is called “one heart.” In this way they become like the Creator through their desire to bestow. For indeed, they want to bestow mutually to each other and reach bestowal to the Creator through this. It follows that they get closer to the Creator within their desire, He comes to meet them, and they meet at some point. After this, they add another desire to bestow to themselves and meet with the Creator, becoming closer and closer to Him, until they reach full resemblance to and equivalence with Him. This is how Israel acts, which is someone who yearns for the Creator, Yashar-El” (directly to the Creator). On this path there are 125 spiritual levels or five upper worlds, which is the whole of our reality. 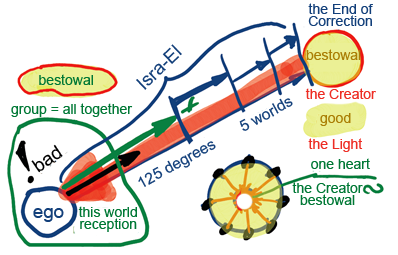 The beginning of this way in which we are now found is called, “this world” (Olam ha Zeh) and its final point is called the “end of correction” (Gmar Tikkun). Question: How can the system of Israel solve the problems in the world? Answer: It is very easy to attain a good and pleasant life in the upper world where there is no evil and our only concern is reaching our end of correction. If you feel bad now, it is because you haven’t performed the right correction in time and haven’t advanced towards the goal according to plan, the determined schedule. If you don’t advance, you summon negative forces upon yourself that push you forward by blows. Therefore, it is written that Pharaoh brought the children of Israel closer to the Creator. Question: How can I leave my narrow personal perception and acquire a general perception, like the Creator? Answer: To the extent that you connect with an increasingly greater number of souls, you grow stronger and expand your vessels of perception. Eventually you reach the state where the whole world becomes yours. Thanks to that, you become like the Creator and equal to Him, filled with the Upper Light. This state is called the end of correction or the adhesion of the created being to the Creator. A person has to attain all of nature as one system, about which it is written: “and they shall all know me from the smallest to the biggest.” We are constantly under pressure, and no matter how much we try to escape it, we will not succeed. On the contrary, we summon even greater afflictions and blows upon us. All the blows are a call from Above to start advancing towards the real goal, to adhesion with the Creator. Therefore, we need to gradually connect to all the people, from the closest circle to increasingly wider circles, until we encompass the whole world. How Can We Awaken From This Nightmare? Question: How can I affect my life? Answer: To the extent that you are incorporated in all of reality, you allow the Light to fill it through you. The Light is good and benevolent. All of creation was created by it and therefore wants to be filled with the Light. By being in the middle, you have to help the Light fill the whole world. In order to do that you need to be incorporated in the creation to some extent and on the other hand to connect with the Light. Thus, you connect the two and the Light can flow through you to all of creation. You are like a conductor, a connecting pipe. Turn on the tap and the Light goes through and fills the whole world. Question: How can I turn this tap on? Answer: It depends on how much you are incorporated in the creation and in the Light, as well, thus connecting the two. By connecting them, you turn on the tap. All this is done inside you. 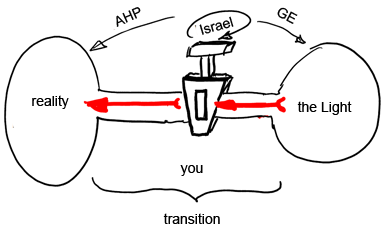 The creation becomes your AHP and the Light becomes your GE, and your role is to become the pipe that connects the two. This is the mission of Israel. Israel are those who turn on the tap. Question: It turns out that if I want to change reality I need to hold on to the tap. Answer: Now, too, you are holding this tap in your hands, whether you want to or not. The problem is that you don’t feel how you block the way for the Light, for goodness, and don’t let it pour unto all of humanity. Question: What is the first thing I should do? Answer: The first thing is to connect with people like you and together establish a system that resembles the Light. Thus you turn on the tap of Light. Question: How is it possible to transform the desires of the general public from materialistic needs to spiritual ones? Answer: First, we need to explain to people that in any case we are looking for inner fulfillment. Even when we just buy some object or organize something for ourselves, for a friend, or for the family, we still experience pleasure. It is possible to measure it, perhaps in the amount of means or in the form of efforts invested, but it is always in feeling. Therefore feelings are the main thing. We work for them, make efforts, live, and raise children. These are feelings of the self, of life, of success. Second, all of us are under the influence of an environment that obliges us to measure success in life through material attainments: a car, an apartment, clothes, a prestigious home or vacation spot. But basically all of this is required only to feel some kind of fulfillment within me. After all, a person doesn’t stuff the house, clothes, or car into himself, they bring a feeling within himself through which he wants to be fulfilled. So we need to create possibilities for fulfillment like these for everyone so that they will be supplied with what is necessary. Together with this, they will not suffer if others are better off, pursue something unimaginable and ephemeral, or constantly reproach themselves because the neighbor’s grass is greener. People will feel self-satisfaction. They will be released from the influence of the masses. Someone’s external success will stop poisoning life for him, and he will stop the pursuit of unnecessary frills. We must explain to people that a person’s ideological mechanism depends upon his feelings, and we can control them. This means that we teach everyone how to be satisfied in every situation. I will reveal a little secret. There is no spiritual world. To the same degree that we agree completely with what is happening with us, this world becomes spiritual. We become Hafetz Hesed, meaning we want nothing for ourselves and attain the characteristic of Bina. Through transforming this to bestowal, we attain the level of Hochma. And Hochma and Bina together give us the level of Keter, the highest level, Olam Ein Sof (the world of Infinity). So it is not the world that surrounds us that is changed, rather our feeling of the world is changed. This is because the Light is at absolute rest and everything depends only on our correction. To a person who is entangled in his materialistic problems, we explain that in principle he can be happy every moment of his life because our sensations are desires. And if he will fulfill them in the right way (we teach him to do this), then he will be happier than the most powerful, richest, famous, and successful person in the whole world. We give him the possibility to be fulfilled. And this is the wisdom of Kabbalah, the wisdom of fulfillment. Basically, our method amounts to this: that the moment a person begins to be satisfied with collective fulfillment instead of personal ones, he will immediately begin to feel himself in the upper world. Answer: There are sparks in every person including the AHP (will to receive), but it depends on the state they are in. The sparks that pull a person upward connect him to the Upper Light and are therefore called sparks of purity. The sparks that are in the depth of the desire to receive, at the moment, cannot awaken by themselves. But through mutual incorporation, we can help them and pull them out of the ego. And due to that we can influence the desire to receive and convey the Light that Reforms, even to a great desire to receive, and use it as AHP of ascent in order to receive the Light of Hochma (wisdom) within it. The revelation of the Creator is due to these thick AHP. Israel does not reveal the Creator if they don’t take care of the nations of the world. If we yearn to draw the Light that Reforms, these sparks grow stronger under the influence of the Light. They grow by the Light since they wrap themselves with the vessels of receiving that can help them. Every spark is like a magnet that pulls vessels of reception to himself. On one hand, it seems to promise a filling of these vessels. I want to fill myself, to receive, to fill my desire to receive. But to the extent that I get closer to this spark, I gradually change and want to fill myself in order to bestow. Then I want to bestow even without receiving anything for myself. This means that I reach the level of Bina. Then I want to receive in order to bestow and thus I reach the level of Keter. All this happens around the same spark that changes by the Light that Reforms. Everything is done by the Light, while we only need to assist it in the cases when the Light at some point allows us to add our exertion. The Light constantly operates, but sometimes it also allows us to participate. It is like playing with a child and sometimes letting him do something by himself. Then we again do everything by ourselves and also make room for the child to participate. This is how the Light constantly plays with us.